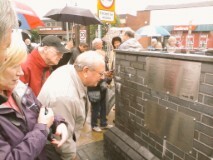 On Saturday the 13th June, over 300 people gathered on the second anniversary of the unveiling of SCAMP, the Sankeys Corner Miners Statue in Burntwood, to take part in the dedication of a plaque containing the names of over 105 local ex miners. The plaque has added the names to over 250 ex miners already dedicated on the Statues Plinth. The statue was originally designed by local man Peter Walker, in honour the miners who helped found the town. The dedication also saw the launch of the 150th Burntwood Wakes in the area, which this year have a new look and feel. Rather than based across the traditional 2 day weekend in August, the Wakes will feature events across a number of months in the town, enabling more people to participate. The Wakes originated as a festival created by local miners 150 years ago at St Annes Church in Chasetown, which is also 150 years old this year. It was a fitting ceremony and event to bring focus on how communities gather and celebrate their heritage. The dedication saw Chairman of the Burntwood Business Community David Whitehouse introduce proceedings, thanking the Miners, local Business ‘Bayley Property Services’ and Burntwood Library for supporting the event. Thanks was also given to the Burntwood Business Community who sponsored the fun day activities. Chairman of the Burntwood Town Council Pam Stokes gave a touching speech thanking the miners for their dedication, this was then followed by a blessing by Rev Linda Hood, before being played out by Rugeley Brass Band. The band continued to played on through the day with the Library converted into a community hub, gallery and arts centre for the day. Local groups had stalls and craft available. A free bouncy castle and face painting was also available for the kids. In total around 1000 people attended the fun day event, which ran between 10.30 and 4pm. “This was all made possible by the Peter Walkers project The City of Sculpture with additional thanks to the local town council, Burntwood Library, Burntwood Heritage Group and Burntwood Business Community who provided fantastic support to the project”. Local ex miner Keith Cooper also received a much deserved mention in proceedings after spending months collecting ex miners names for the new plaque.